Happy beautiful Friday morning everyone! To start off my belated birthday weekend, I thought I would post my recipe for Red Wine Sangria. There is something about sunshine and warmth that just screams for this cocktail. It’s one of my favorites because there are so many variations depending on what fruits are in season. 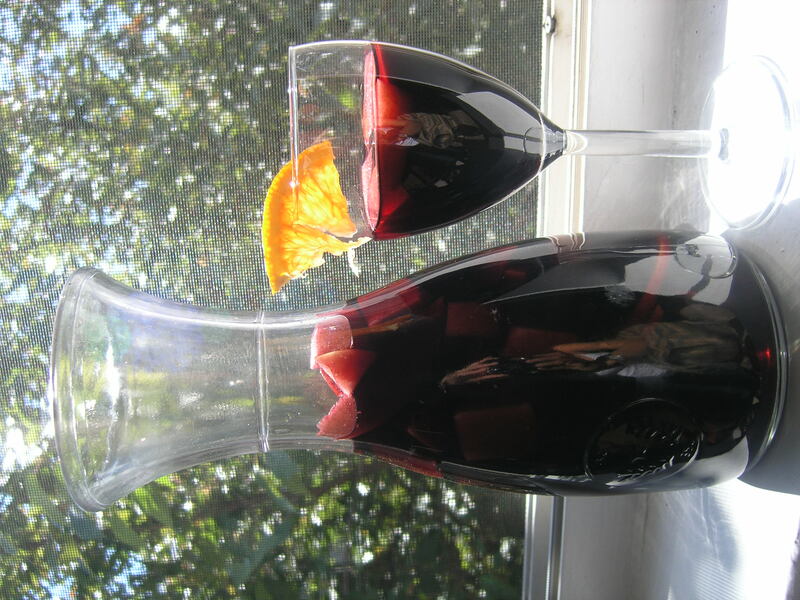 Traditional sangria is red wine that soaks with fruit in it to bring in more interesting flavors. Many restaurants, whether they are Spanish or not, have thousands of variations, blending lots of different fruits and alcohols with red wine, white wine, and even champagne. Today’s recipe is traditional, but as the summer progresses (and more baseball wives come out for the season) I will make sangria that is of the mixed alcohol variation. Enjoy it along with your weekend! Cut the oranges, lemon, and lime in half and then into thin slices. Reserve a few orange slices for garnish, and put the remaining fruit in the bottom of a large jug or pitcher. Cut the apples into slices (skin on) and do the same. Pour the wine over top, cover, and refrigerate for at least two hours to chill. Serve in cocktail glasses over ice with a slice of orange for garnish.